Gold leaf or foil is a trendy idea to use in decor: in spite of its elegant metallic shade, it brings a slight nonchalant touch. If you wanna add a touch of elegance to your home without applying much effort, go with accessories! 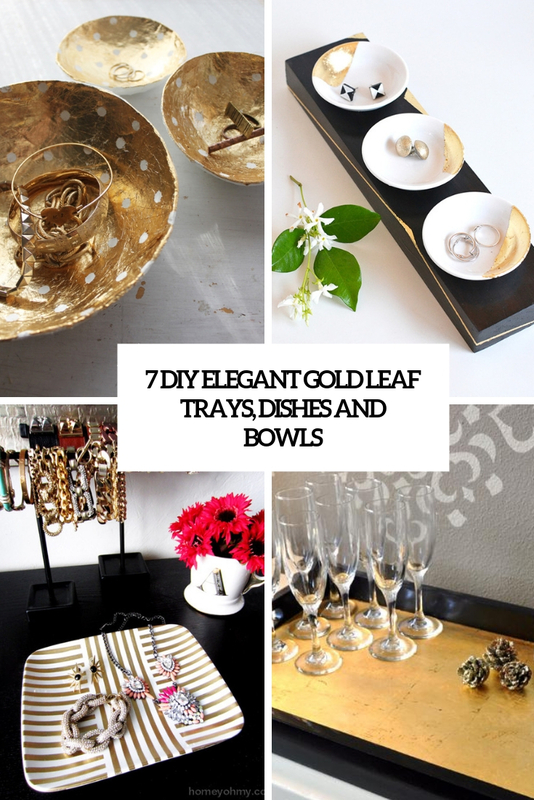 We’ve prepared a bunch of cool gold leaf trays and bowls to store anything you want, take a look at the tutorials and get inspired! This project is about making a catch-all tray with gold leaf decor. The tray is actually a ceramic “salad plate” from Target, though that should not suggest this project is food safe (it’s not!). 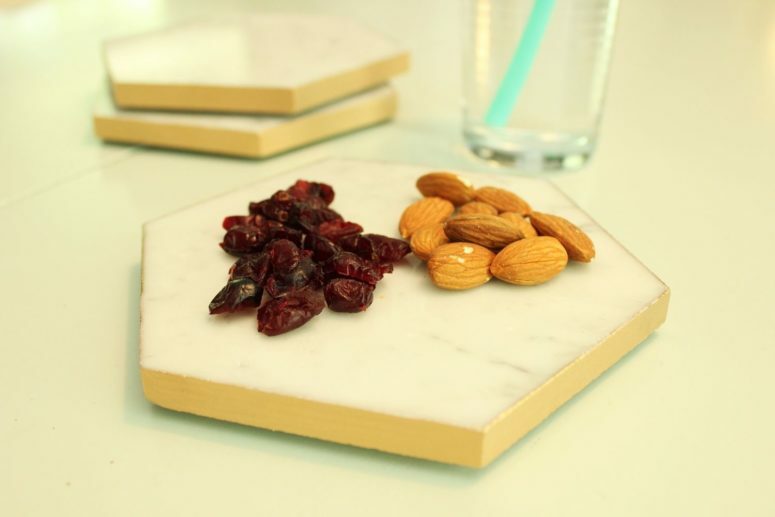 I totally love the geometric pattern of the tray! 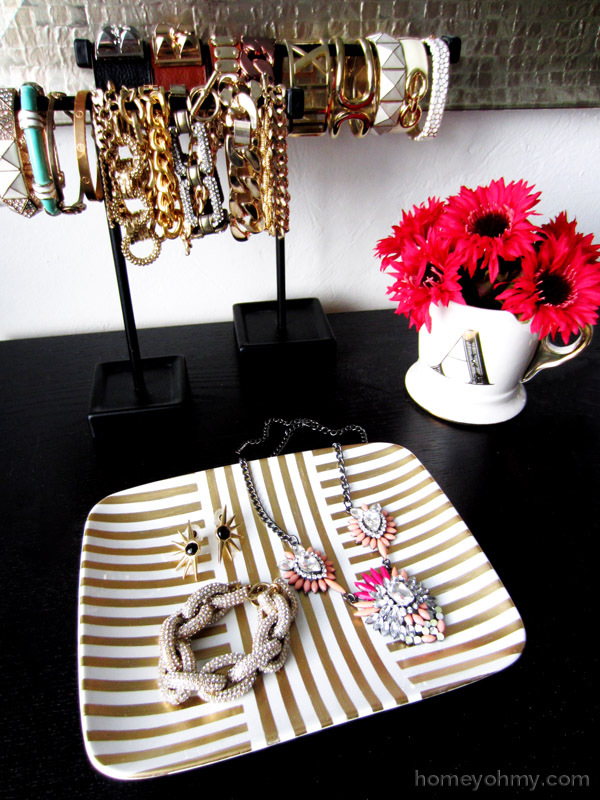 Read how to make it and use this tray in your entryway or store your jewelry on it in your closet or bedroom. I firmly believe that not having anywhere to stash little clutter items – like your desk-side USB collection or just a few paper clips – leads to desk-top chaos. 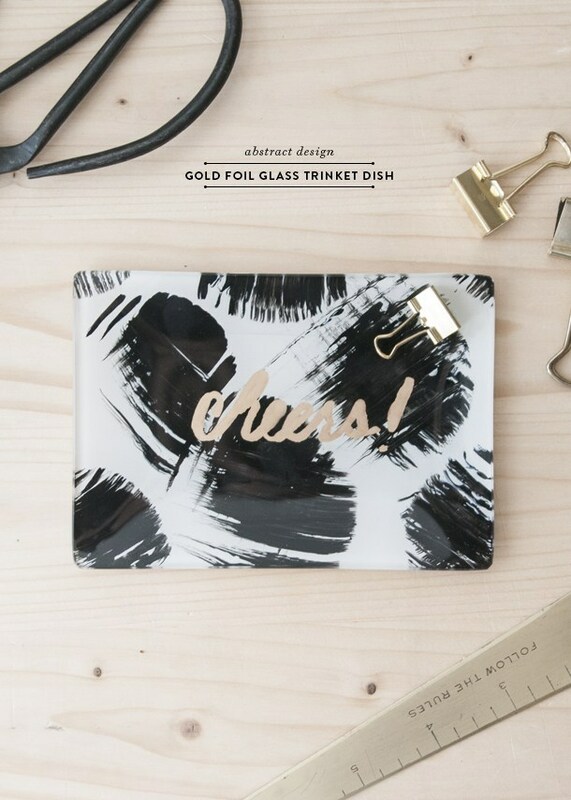 Here’s your solution: this is a cool and stylish trinket tray with a modern feel. The tutorial is surprisingly easy, quick, and inexpensive, and the materials for this project are easy enough and you may have several of these items already at home. It will be not only a cool trinket dish but also a nice hostess gift. Get inspired! 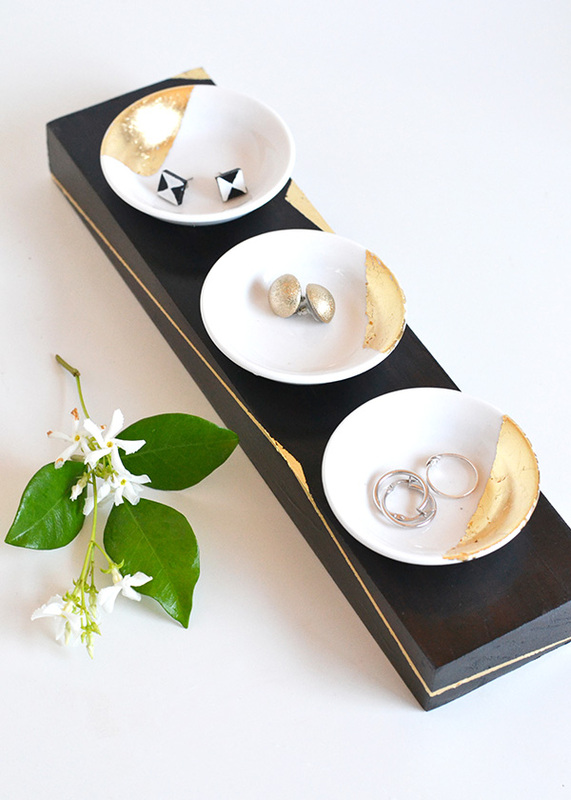 Little jewelry dishes are always to the point: one for a desk, the bathroom and your bedside table. This tutorial on how to make petite dishes also incorporates a major trend – gold leaf. These sweet gold leaf trimmed jewelry dishes would make a lovely gift too, so if you’re thinking about handmade for some holiday, get onto this and get a head start! 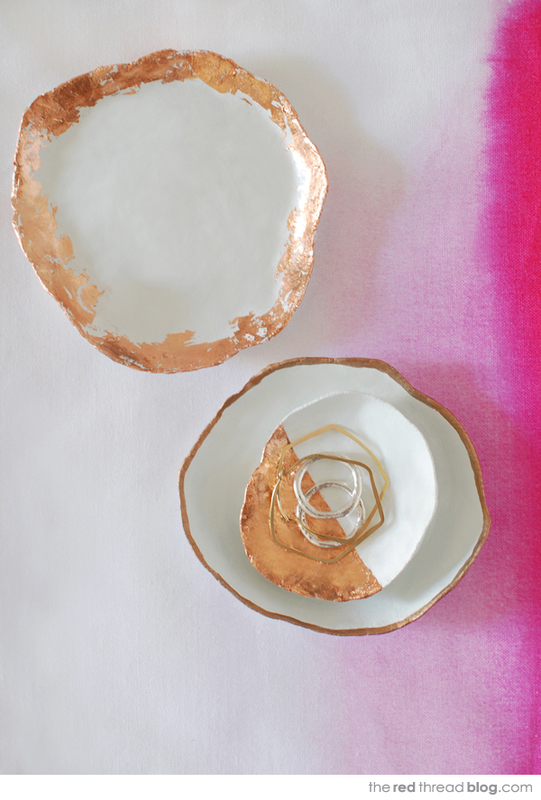 These aren’t just simple dishes for jewelry and other small stuff – these are paper mache bowls with gold leaf, which looks so beautifully imperfect that I can’t help admiring! 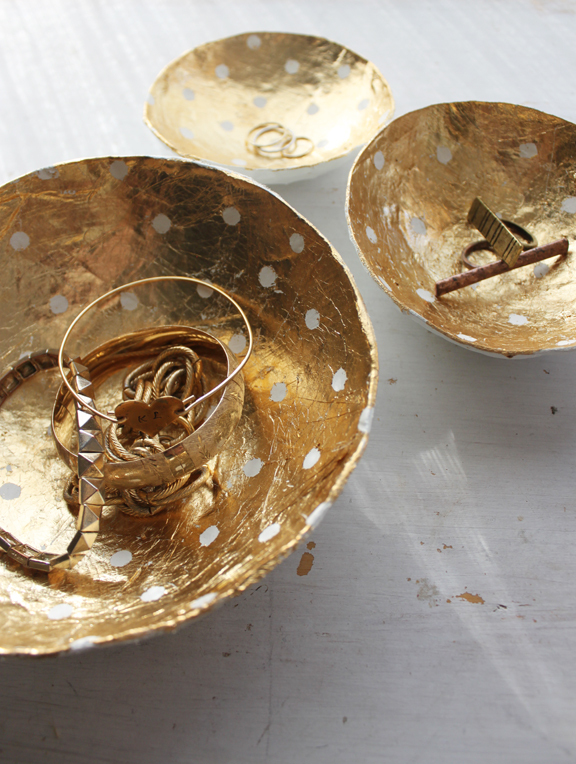 This is a whole setup of several gold leaf bowls with funny polka dots, all the bowls are of a different size, which means that you’ll be able to use them in any space, even the smallest one. 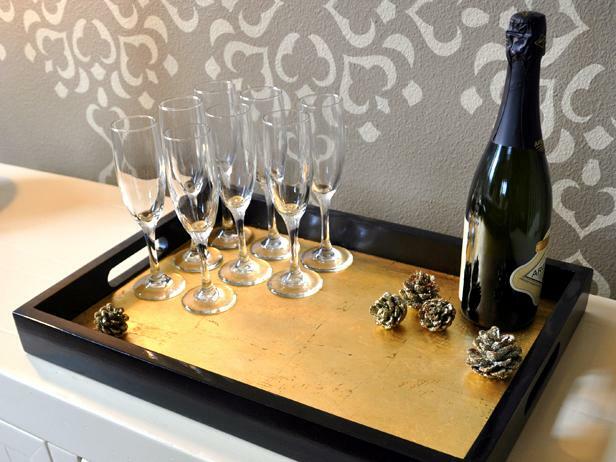 Create a beautifully chic serving tray for entertaining by lining its surface with gold leaf. It’s a very elegant idea for any time and space and you may place anything there. I enjoy the cracks and imperfections that are featured on the tray, they bring an elegant antique feel. The tray is ready to be stocked with drinks, spirits or appetizers! Looking for ultra-modern jewelry dishes for your home? Here’s a tutorial that will satisfy your requirements! This project contains instructions on not only making elegant gold leaf trinket dishes but also a dark stained holder with gold leaf motifs – it makes up a cool and bold set. Such a piece is a very refined and elegant idea for any home, enjoy!